The Year's Favorite quilt block is a four patch that is a perfect choice for a beginner quilter. It contains only the two most commonly used patches -- the square and the half square triangle. 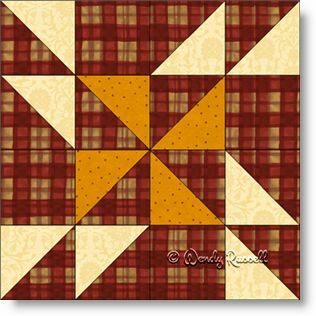 When I chose the fabrics for this block, I deviated from the "norm", in that I used the focus fabric as the background. Since my background fabric is dark, the lighter fabrics draw your eye into the pinwheels. Two very different quilts evolve when you choose to set the blocks side by side or on point as shown in the sample quilts illustrated.